At Project Mosaic, our focus is grass roots and global. We use education to help change people’s thinking. New York Firefighter Lieutenant David J Fontana was one of 343 firefighters that died while helping to rescue about 28,000 people from the World Trade Center following the attacks of September 11, 2001. Dave was 37. He left behind his widow, Marian, and his son, Aidan, who was five. Dave belonged to Squad Company 1, a fire station house at 788 Union Street in the Park Slope section of Brooklyn whose firefighters are specially trained to tackle the most difficult and dangerous of fires and other emergencies. Twelve of the 27 men of Squad 1 were killed on September 11. Only 15 men in the squad survived. Dave died on his eighth wedding anniversary. 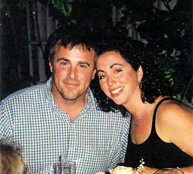 Such was his love for the fire department that, in 1993, Dave insisted that he and Marian be wed on September 11. This way their anniversary would be “nine one one” – the phone number for contacting the fire department or other emergency service. Dave was a “renaissance man”, having trained as an artist at university. Sculpture was his passion and his works of art – in carved wood or melded steel – were big and bold. The sixth of seven Fontana children, Dave had a keen interest in history and spent many hours off duty researching the lives of members of the Fire Department of New York that were killed in action in World War I or World War II. He organised the creation and unveiling of several plaques at fire stations to commemorate firefighters killed in combat. Coming from a large extended family, Dave was an internationalist that loved to travel. He delighted in visiting his cousins in Ireland. Dave’s last known location on September 11, 2001 was at or near the 45th floor of the South Tower, the first of the two 110-storey towers to fall. He and hundreds of other firefighters ran up emergency stairs, despite being loaded down with heavy rescue gear, and they helped to get thousands of fleeing office workers down the stairs and out to safety. Dave was a doer, an optimistic person full of passion for life. 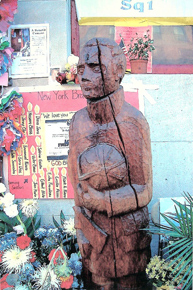 Project Mosaic celebrates Dave’s love for his family and his friends, and the deep love and respect for his fellow human beings, regardless of their race, religion or background, that prompted him to rush into the South Tower of the World Trade Center on September 11. "Aidan, my love, your Dad was a hero. He spent his life and gave his life saving others." Lieutenant David J Fontana of the Fire Department of New York was a firefighter, sculptor, historian, scholar, a spiritual man. As a son, brother, husband, father and friend, he is remembered with love and affection. We miss him every day. Dave grew up the second youngest of seven children. With four brothers, he had his share of adventures. On summer vacations, he and his family went camping from Maine to Key West, Florida and visited places like Valley Forge and St Augustine, which helped nurture his interests in nature and history. He loved to swim and was on the swim team at his high school. In college Dave played rugby with great enthusiasm. At home, he and his friend, Andy, ran together to keep in shape. When it was time to go running, Andy would appear at the back door, whistling bird calls. David Fontana was a man with a love for people and a great sense of humor. During high school and college he worked as an ocean lifeguard at Jones Beach and Fire Island, and rose to the level of Bosun. At Field 6, Dave carved logs into tall sculptures. His “Kahuna” stood beside the lifeguard shack, a seven-foot-high totem with its tongue sticking, there to ensure the blessing of good waves for surfing. Dave was seriously dedicated to life saving. But he also loved making people laugh. 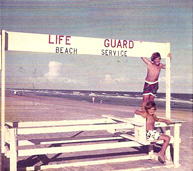 On rainy days at Jones Beach, Dave would entertain the other guards in the lifeguard shack with puppet shows. Undeterred by a dearth of materials, he resorted to a felt-tip marker and his feet. Dave drew faces on the bottoms of his toes and performed plays, christening his production “Toe Puppet Theater”. While off duty from protecting the swimmers from big waves, Dave built up his strength and skills by rowing a surf boat with his friend, Steve. 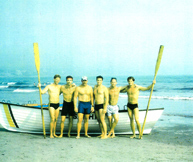 On days off, their Baldwin Bay rowing team raced at Sag Harbour on Long Island, South Street Seaport in New York Harbor and Newport, Rhode Island. Dave’s artistic talent was developed at C W Post College, where he graduated with a Fine Arts degree in sculpture. At college he played a lot of rugby and he met his future wife, Marian. His teacher remembers him for his ability to work with and help other students. 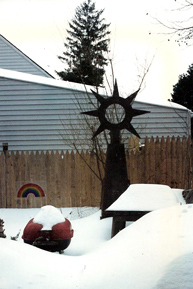 Some of Dave’s sculptures were eight-foot-high star-shaped towers of steel. One was a monkey carved from a log that stood six foot tall and that made people smile. Years later, for his firehouses Dave carved in wood life-sized statues of a bunker-clad fireman and also the figure of St Florian, the patron saint of firefighters. When Dave graduated from the probationary school of the Fire Department of New York (FDNY) at Randall’s Island, he was one of the “probies” assigned to display their skills. His challenge was to rappel down the outside of a six-story building. I was more worried than impressed. After the ceremony, we celebrated with lunch at a little restaurant on 93rd Street. I was inside the restaurant, sitting at a table by the window, when I looked out and saw Fireman Dave peering at me from behind a tree and smiling impishly like a little boy, to tell me that nothing had changed, not to worry! 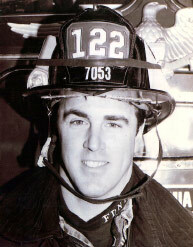 As a firefighter Dave served in the Park Slope area of Brooklyn at Ladder Company 122 and later Squad 1. While working at Ladder 122, he researched the history of the turn-of-the-century firehouse. He lined the staircase walls with framed pictures of the men and their rigs, ranging from horse-drawn to today. His wood sculpture of St Florian stood by the door. At Ladder 122 Dave became curious about firefighters from his house that had been killed in World War II and he wanted to know more about them. This research expanded to include all the firefighters that had died in the war. While doing his research, he helped organize the data at the George Hand Library at the FDNY site on Randall’s Island. With the information he found, he helped put up a memorial for those men at his firehouse. Today the FDNY has used Dave’s research to install a permanent memorial at their training center on Randall’s Island, with a Fire Department helmet for each soldier that died in World War II and Iraq, and a book of their biographies for visitors to read and to which families can add entries and sign. From Ladder 122, Dave moved on to Squad 1 in Brooklyn’s Park Slope. Firefighters at Squad 1 are specially trained to deal with the worst of emergencies, including chemical fires and disasters in which firefighters have to go rescue the first-responding firefighters. At Squad 1 Dave’s fireman sculpture was on display. He built an oversized “Santa Chair”, which still comes out every Christmas. He worked hard to improve his skills, from climbing walls to using new equipment. He studied for and was promoted to Lieutenant. An enthused resident of Park Slope, he visited classrooms in the neighbourhood and helped local Boy Scout troops. Those passing the firehouse on busy Union Street knew him for his friendly greeting. Dave was a dedicated family man. He was happily married to Marian and in 1996 they rejoiced in the birth of their son, Aidan. Dave was well known in Park Slope, where he lived and worked. The church of St Francis Xavier was over six blocks from the apartment. On a lovely summer day in 1996, Dave, walking with his family, carried Aidan in his arms to the church for his baptism. Dave’s face, wreathed in smiles, made everyone else smile. As Aidan grew bigger, he loved to wrestle with Dave. One day they were having their usual fun when four-year-old Aidan was bumped and started to cry. When Dave’s wife, Marian, asked what had happened, Dave said “He started it!” Everyone laughed. He and Aidan often walked to the nearby stores to buy toys and books and ice cream, Aidan riding on Dave’s shoulders. Dave walked Aidan to school and, in Prospect Park, a few blocks away, taught him to ride his bike. Dave had collections of Star Wars toys, Thomas the Tank Engine train sets, and Revolutionary War hats and stories. He took Aidan to Williamsburg, Virginia to show him where the stories happened. Dave’s favorite hat was a cap that proclaimed “Life Is Good”. Dave loved America and its history. During World War II, his uncle, Sergeant Eduardo Fontana, was killed at Bastagne in 1944 in the Battle of the Bulge. After graduating from college Dave and Marian visited his uncle’s grave in the U.S. Military Cemetery in Luxembourg. Dave managed to track down and interview the corpsman in the 101st Airborne who was with Ed when he died of his wounds. His love of travel carried him from Maine to Florida, from Hawaii to Europe. In 1986 and 1987, Dave got to visit Ireland and finally meet his Irish cousins. In 1988, he went back with me and one of his sisters. Dave brought his Irish cousins into our family, aarranging for them to spend summers with us on Long Island. On these trips and others, he grew to love both Ireland and his family there. He was proud to have dual citizenship, as an American and Irishman. Dave was interested in learning to pray and in helping those in need, particularly a Franciscan family in India. Dave and his family are still prayed for in Alleppey, India. Alan at the Franciscan Family Apostolate described Father Mychal, a fellow Franciscan, and Dave as followers of “the little way”, men focused on a simple lifestyle in their relationships with others. He cared about his widowed mother and his brothers and sisters. He was close to his wife and son. Aidan was five years old and had just started kindergarten when Dave was killed, fighting the fire at the World Trade Center on September 11, 2001. A year later, in commemoration, the New York Philharmonic included these words in a program they performed on September 19, 2002. We love Dave dearly and miss him every day. He is remembered and honored by many people in many ways. In remembering Dave at his memorial service in Brooklyn, a woman my age came up to me and told me how she missed his smile and hug as she walked by the firehouse. His eldest nephew, Rich Fontana, proudly wears the image of Dave’s 1627 firefighter badge tattooed on his leg. What was recovered of Dave is buried at Green-Wood Cemetery in Brooklyn, a place he loved both as an artist and a historian. On hot summer days the lieutenant would park the firetruck there for lunch. Many times Dave walked through the cemetery, finding Revolutionary War sites, firefighter memorials, the graves of famous and notorious New Yorkers. From the high hill where he is buried, the Statue of Liberty and New York Harbor sweep into view. He would have loved it. Lieut. David J. Fontana F.D.N.Y. He loved his family, Glengoole, and Ireland. To carry Aidan on his shoulders. Think of Dave. He’ll be there. He lives in our hearts and memories. May his blessings be upon us.